The 3-m Telescope was completed in 1959 and named for Donald Shane, Lick Observatory Director during its design and construction. The Shane Telescope is the largest telescope on Mount Hamilton and was the second largest in the world at the time of its construction. There are three foci at which to place instruments: Prime, Cassegrain and Coude. Facility instruments are available at each focus. Observers wishing to place their own instrument at one of the foci should contact a support astronomer to assess feasibility. Prime 5.5 No facility instruments currently available. 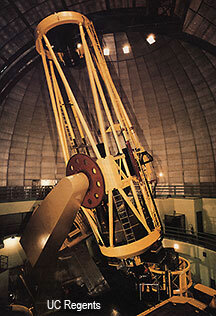 Telescope operators (TOs) are provided by Lick Observatory to assist observers at the Shane Telescope. TOs primary duties are to (1) protect the telescope, and (2) help the observer acquire as much data as possible. The TO does have the authority (as well as the responsibility) to terminate observing at any time in order to protect the telescope or equipment. The Shane Telescope is available to the University of California astronomical community by subscription. All new users must be checked out by a resident astronomer on their first night. Please request support on your time application. Please direct questions to a Mount Hamilton support astronomer, sa@ucolick.org. For historical reference or those working with older data sets, decommissioned instruments are listed below.